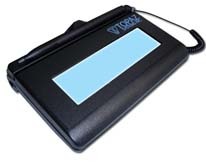 The SigLite®LCD 1X5 is an advanced biometric electronic signature pad with backlit transflective LCD that displays “electronic ink” under the pen tip during signing. Bundled secure software APIs provide for interactive text, graphics, and pen-tap hotspots and checkboxes which enable users to navigate screens, read agreements, and select preferred options before signing. 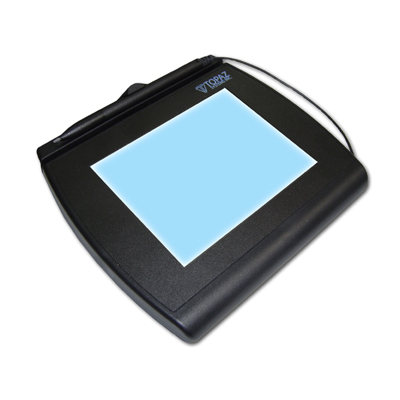 The SignatureGem® LCD 4X5 is an advanced biometric electronic signature pad with large, bright QVGA (320 x 240) TFT LCD that captures and displays hi-resolution "electronic ink" under the pen tip for a natural signature. Bundled secure software APIs provide for interactive text, graphics, and pen-tap hotspots and checkboxes which enable users to navigate screens, read agreements, and select preferred options before signing. Topaz –BHSB is dual-interface and can be used in either HID USB, (cable provided), or serial interface (serial cable sold separately). –BBSB model provides a Virtual-Serial USB connection. SE model used in certain custom applications. 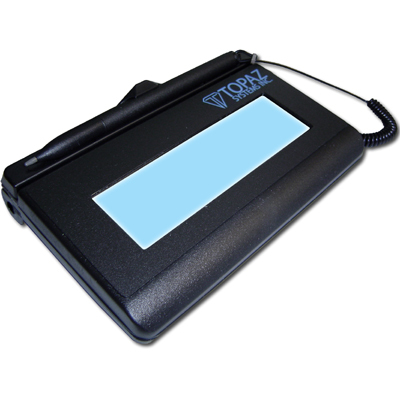 Rugged Kiosk-mounted Electronic Signature Pad with Backlit LCD DisplayKioskGem is a ruggedized electronic signature pad for use in public-access or unsupervised kiosk environments. The signature tablet bolts to a housing with no exposed fasteners and the pen is tethered with a steel cable rated at 470lbs. 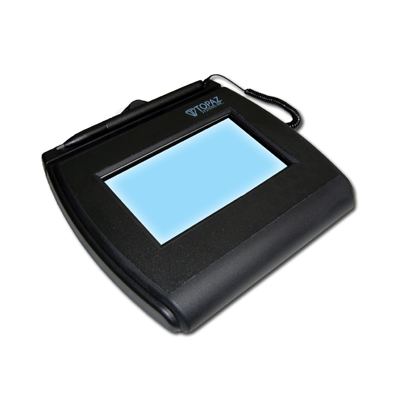 The Backlit LCD display allows users to view the signature as they sign giving added comfort for the signee.